PMQ: Hey Pack Mom. I have a doggie question for you. 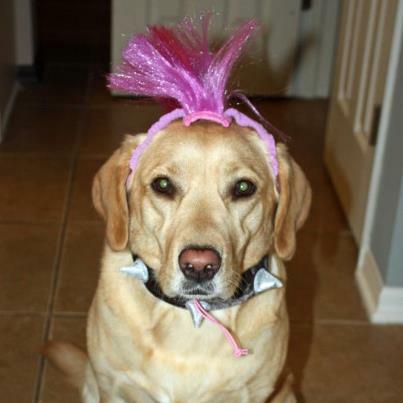 My yellow lab, Hazel, loves to get hitched to my bike and go along with us as we ride through the trails in our neighborhood. 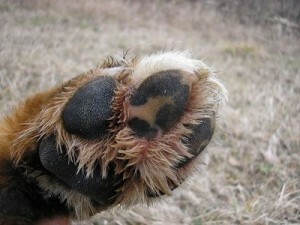 The only problem is, she often returns home with scraped and bloodied paw pads. She just insists on being right behind the leader and will not stop, even when she is hurt. Yesterday it was especially bad. Skin off the pad was hanging, I had to cut it, put neosporin, and bandage three of her paws. She is limping around today and breaking my heart. So, how do I treat her injured paws and how do I keep this from happening any more? PMA: Hi there! Oh, poor Hazel! I would let the paw pads heal and then you can try items such as PAWZ. It is like a swim cap for the paw. Since these are disposable (they come 8 or 12 to a pack I believe) and are rubber, you will continue to have to purchase these. 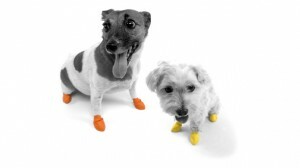 Or, you can try a dog shoe like the shoes from Ruff Wear. Very sturdy. It might take her a bit to get used to them, but it will be worth it if she really likes to run the trails or even go hiking. To heal the paw pads, I recommend using a dog safe product like Halo’s Healing Salve , Musher’s Secret or something similar. These products will not only heal but moisturize and coat. Let me know what you try and what works for her. It is wonderful that she joins you and the family on your rides though. Awesome! Way to go! Result: Hazel’s mom found a pair of boots especially made for hot climates called “cool boots”. They are made by Baxter Boo and claim to be the boot that stays on the best with ventilation while also defraying 75% of the heat from the pavement. Help for Paw Pads- Hazel in Costume! Thanks to Carrie, Hazel’s mom for being such a dedicated pack mom!